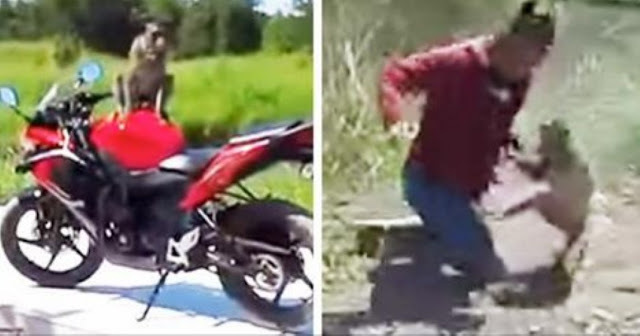 Home entertainment fun Guys Interesting prank recent slider video Viral Section vs Man Hits Monkey For Messing With His Bike; Monkey Hits Back In EPIC Style! Man Hits Monkey For Messing With His Bike; Monkey Hits Back In EPIC Style! Chachoengsao, Thailand. A man parks his motorcycle up by the side of the road. On his return – a monkey‘s sitting on it. Fiddling around. The dude gets annoyed. Shouts at the little primate. He’s ignored. So he throws his shoe at it. Then it kicks off BIG TIME! If the idea of a little Thug monkey beating a man up in a scrap amuses you (and it should), then this might just be the greatest video you’ve ever had the pleasure to watch.